A friend of mine was in a pretty bad situation for several years. She was living with a guy who basically treated her horribly, spent all her money, and caused her a ton of grief and stress. Things had been escalating for a while and one night, late on a Sunday, she called in tears saying that she had to move in a big hurry. I wondered what had occurred that had made her finally realize it was time to get away from this individual for good and to never look back once she was free. Without getting into the exact details of the situation, the fact remained that she needed to move/pack up her belongings as quickly as possible. Well, the phrase ‘as quickly as possible’ seemed more like ‘as quickly as IMPOSSIBLE’. Basically she had a week to pack up her apartment (a one bedroom), find another place to live, and get out of there before this individual returned (he was away on business for a week). The stress she was under at that point was overwhelming and of course, I offered to do anything I could to help. I vaguely remembered that a friend of mine had mentioned portable storage, but I couldn’t recall all the specific details, so I advised my friend to start packing quickly and I would figure out the actual ‘moving’ part of her situation. The next morning I started googling moving and storage companies, how to move quickly, short term storage options in case she wasn’t able to find a new place to move into right away, and of course how much all of this would cost. This is when I stumbled upon the Big Box website and as I read the details of their services, I remembered that this is the company my other friend had used a few years before albeit under much better circumstances. As I read about the Big Box portable storage unit, I started to think that this would be an ideal solution for my friend. Around San Diego, it’s next to impossible to find an apartment on such short notice, and even if she was able to find a place that was coming available, the issue of what to do with her belongings in the interim was a biggy. And on top of that, most of the moving and storage companies would charge her an arm and a leg if they were even able to work under the tight schedule she was under trying to get out of her place in a week or less. 1. Get her belongings packed and into a storage unit in under a week. 2. The ability to store her belongings for a long or short period of time so that she could focus on finding a nice new place to move into. 3. Easy storage access to her belongings at any time. The Big Box representative was so helpful and I knew this was the perfect solution. I quickly called my friend, outlined how the Big Box service worked, and then with her permission, called Big Box back and scheduled the delivery of a portable storage unit. They were able to schedule a delivery for the very next day and promised that as SOON as we were ready, they would come and pick it up. The representative was very considerate when I explained the situation and I felt reassured that this was going to help my friend in a major way. I have to say, I was so impressed with the way Big Box treats their customers. We were able to pack up my friend’s apartment, load everything into the Big Box storage unit, and have it picked up and delivered to the secure Big Box storage facility in under 36 hours. A miracle right? Not really. 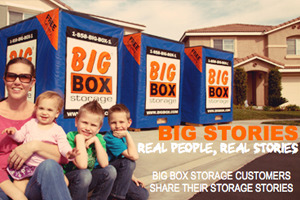 The entire process was simple and seamless thanks to Big Box storage. With her belongings safely stored, my friend was able to find a nice new apartment. After staying with me for a month while her new apartment was readied for her to move in, all we had to do was call Big Box again and have them deliver the portable storage unit to her new apartment, and we unpacked. It was so simple! I’m happy to say that my friend has now been free of her former situation for just over a year and is living a happy life again. Big Box storage was material in allowing my friend to accomplish such a quick move in a short period of time.